It is 8:30 am, I have been up for about three hours. I dropped off my son two hours ago and he should now be about two hours into the first leg of a 205 mile bike ride. 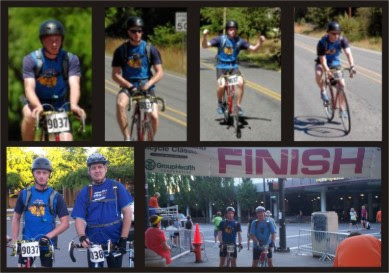 Today is the annual STP (Seattle to Portland) bike ride. 10,000 riders from all around the world, show up each year to take part in this event. Most riders will make the ride in two days but there are those few who will do the ride in one day. Two years ago I also made the drive to the starting line but then it was my son and I heading out. This was not an event that I would have undertaken on my own without encouragement. The motivating factor came on Father’s Day when my son presented me with a ticket to make this ride with him. Yikes! Fear? Yes! Excitement? Yes! I quickly started counting on my fingers. Six, four, seven, three, two, five…’Swear words!!! !’ I only had 27 days before the event. My mind told me in a minute there was no way. My heart said, ‘You have to.’ My son informed me, that even though traditional wisdom recommended a seven month preparation period for this ride, he was confident 27 days would be sufficient for me. Now that is serious manipulation. I had not been on my bike in almost a year and besides I didn’t even have a road bike. My bike was a commuter bike with wide friction laden tires and a heavy metal frame. Even though it was comfortable to ride it was not suited to take a 55 year old, out of shape, 30-40 pound overweight guy 200 miles. That afternoon, my old commuter bike and I went for a 10 mile ride. My legs felt like rubber by the time I finished. The next day I rode to work, 11 miles each way. I skipped the next day. By the next Saturday I had four rides behind me, all about 10 miles in length. I had decided my next ride would be a minimum of 25 miles. My chosen route was all very flat, an exceptional easy ride. Getting a 25 mile ride the first week of training was an important psychological hurdle. That day I made it 30 miles and I felt exhausted and dizzy when I finished. By day 25 I had found a used road bike. It was an older bike, from the late eighties or early nineties. The aluminum frame was sturdy and even though the bike was under geared, with only 12 speeds, it was a huge improvement over my commuter bike. I had taken it on one 50 plus mile ride which at the end I felt surprisingly confident with the knowledge I could have gone further. The last two days before the event I did not touch the bike except to lube it. On day 28 I finished the 200 mile trek, 10 hours the first day and 12 hours the second day. The only hard part was the last 20 miles the first day and the last 50 miles the second day. My son a fully trained fireman stayed right with me the last day allowing me many rests during the 95 degree afternoon heat. We crossed the finish line fifteen minutes after the deadline. But, by the insistence from my wife, a kind official gave me and my son our completion packets. My son was proud of me but I was just glad to be finished. As I sit here writing this I have a few slight feelings of sadness. I wish I was once again, headed down the road with that cool morning breeze hitting my face along with hundreds of other riders all headed toward a common goal. But, the memory I am missing most is riding side by side next to my son heading south and not feeling almost old. Seattle is having a heat wave and it is awesome, 85 degrees today. A few months back I went to Florida and it was 92 degrees on the coldest day. Arriving back in Seattle I realized I had this low grade anger or irritation going on. I finally took some time to think about why I was so cranky and I realized I was bitter that I had lived in this nasty Seattle rain for 50 plus years and there are places where it is warm and it is warm almost all the time. So I am pretty, pretty, happy about this warm weather. Right this minute I am in my bedroom sitting in my underwear. It is just me and my still kind of fat soft belly. No one is bothering me. There are no bugs flying around bugging me. It is 11:30 pm and it is still 78 degrees outside – Yes!! I should probably go to sleep, but I am too excited. I once heard a friend say, ‘If it gets any better than this, I will probably be in heaven.’ Right at this minute, I am feeling it. I had to write this tonight because tomorrow it will no longer be nice but it will be hot. It is supposed to be 93 degrees tomorrow. So, I will probably be cranky by the time I get to sit and do some writing and by then I will be wishing for some good old mild Seattle rainy drizzle. That reminds me, have I ever talked to you about the crazy phenomena, when things are ‘just right?’ I may be bringing something up that you have already figured out, but for me it is still a conundrum. My weekends always have a couple of those just right moments. I am usually up before the rest of the household. I start a pot of coffee, while the coffee is brewing I may do some simple task and then I get that first cup of coffee. That just right moment usually happens on the walk to my chair where my laptop or book is waiting for me. It is that first sip of coffee. It is the only one that day but there it is, a just right moment. Are you feeling it? – I heard someone use that term the other day so I am trying it out. Let me know if it works for you, I mean if you’re feeling it. Another just right moment is after I come home from work, have a little dinner, sit down with my laptop on my lap. First I check my email. Then I check if there are any comments on my blog. And then comes the part where I get to start writing. Here comes a just right moment. The laptop by now is warming up. The food in my stomach has taken away that grumbling feeling, and the warmth from my laptop sitting on my lap in the midst of typing or reading, slips me into my evening nap. That moment, right before it is full sleep. that is a just right moment. Tricked you didn’t I? You probably thought I was going to describe some mushy description of writing pleasure. I suppose now and then I write some string of words that are pretty good but I would never say they are just right. Do you have any just about right moments? I have a new picture on the background of my computer. The picture is of my oldest daughter and it was taken during my father’s day gift on father’s day. She is the oldest of my small tribe. Being the oldest, of course she is a good leader, thus she planned this little affair. This day was a throw back down memory lane and it was almost perfect. My son brought the boat for this scheduled day of fishing. We didn’t start early and almost nixed the trip because of the rain but we were all there and all managed to find some sort of rain gear. So, off we went to the local lake for a day of fishing. My niece took the place of my youngest daughter and I have a great picture of her getting fish slime splatter across her face. Imagine being slimed with delight. Only fishing can do that. Today was trout fishing but in days past when the kidlets were small it was usually perch or bass, both which are in abundance. When little ones are in the boat one is wise to find a way to keep the action steady and regular. Perch usually are more than happy to fit the bill by literally jumping onto the hooks. A couple of traditions were developed during those early years of fishing excursions. 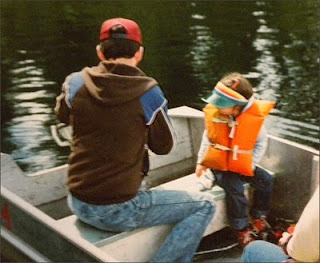 But first let me back up for just one moment and run down memory lane to the first time I took my kids fishing. This trip of course included only my oldest daughter, you see the other two had not yet been thought of, let alone conceived. It was me and my friend Al and of course B at the age of 18 months maybe 24 months. I don’t really remember, it was over 20 years ago. You don’t really expect me to remember everything do you? Across the railroad tracks Al and I carried the boat. The gear came across next and then B donned in her tiny orange life preserver along with her blue blankie. I am pretty sure she had her thumb in her mouth and it was always best if it was her left thumb. B is left handed. For the first hour she was excited leaning over the edge while I had a hold of the back of her life preserver. She was unable to reach the water without falling in but her little hand splashed the water back and forth as I held her tight. It wasn’t that long before the newness had worn off and B was asleep on the floor of the 10 ft Livingston. Thumb in mouth, a firm grip on her blanket with it pressed tight to her cheek, B slept. Al and I fished for several hours catching true cod and bringing home a mess of fish for fish and chips. The trip turned out to be a bit hard on little B. It might have had something to do with her thumb sucking and the polluted water in Puget Sound, we were anchored about 200 yards off the local treatment plant, which I can’t believe I did. The fishing was always good there but seriously what was I thinking? I could give you the play by play results of the aftermath, but I will just leave it with, I had to clean up more than B. It was a definite mistake to leave B naked unattended in the bathroom while I ran for clean clothes. All I can say I am glad we did not have carpet on the bathroom floor and that the door was painted with a strong enamel based paint. This transition is going to be a bit tough so I am not even going to try for grace or smoothness. A tradition we developed on our fishing trips regardless of how good and healthy a lunch my sweet wife had packed for us was to stop at the local mini mart and I would pick up a box of those nasty mini chocolate Hostess donuts – yum. So here we are on the lake fishing, on Father’s Day now 20 plus years later and B pulled out a box of mini-chocolate Hostess donuts. We passed them around and everyone partook of a traditional rite of passage. I got to bait hooks for my niece and daughter, just like old times. My son drove the boat and I did my best biting my tongue more than once because I kept forgetting I was in the presence of adults not children. Once I totally forgot my daughter was completely grown and as I jumped across the seat to help her with her fishing pole. My son laughed at me which of course made it all feel normal. My niece caught her first trout, B caught two rainbows, and my son and I were skunked. I forgot to ask him how it felt to be the captain and fulfill the duly appropriate honor of getting skunked, which is par for the course when insuring all his guest’s lines are not tangled. It felt wrong being the one cared for but the chocolate donuts tasted right and made it all seem normal. That was a great father’s day present! Thanks all you little Quills. My night stand is a mess. My stack of books is getting pretty high and beginning to lean. Soon there will be a fall. When that happens maybe I will be fortunate, and the cat will be nearby, scaring it into a much desired heart attack. Who knows something good could come from this colossal mess. At the top of the stack and the book having the best chance of hitting the cat will be Frank McCourt’s book, The Teacher Man. This is the first book of his I have read and it is becoming a personal favorite. Under it is a book written by Ralph Palmen, 8 Critical Lifetime Decisions. Anything Ralph writes is worth reading, he has wisdom worth passing on. Next is Trusting God by Jerry Bridges, I am not really reading this book but I pulled it off the shelf looking for some answer to some question. I don't really remember what that was about. Regardless here it sits waiting for the cat to walk by. Next comes a garage sale find, a used New American Standard Version of the Bible. What does that say about me when my Bible is buried four books deep, hmmm…. Next is a book on writing called Characters, Emotion and Viewpoint, by Kress. Under that is a novel I have tried three times to read called, The Gold of Exodus. Oh, look another Thrift Store find, Writing Fiction by Cassill. Oh, I can’t believe it; under this book is another Bible. I wonder how long it’s been since that one was read, let me blow the dust off it. Next is a book called, Three Mennonite Poets. Poetry is not my thing but I did read one of the poems. Next is a grammar book called Write Right. I guess it is a nice thought thinking I can learn some grammar at this time of my life. I have made little progress. The main problem to be quite frank is that the book is a bit boring – surprise! And at the very bottom is a book called, Blest Atheist, by Elizabeth Mahlou, written by a fellow blogger. It is her life story and a very interesting read. Elizabeth takes the reader through her depths of tragedy and back to the heights of human achievement. If you choose to read this book, get ready to laugh and cry within the same page and sometimes both at the same time. This book is not for the emotional weakling. I had to put it aside several times before I could pick it back up. Stack number two – the short stack – the active stack, first is ‘Finding God’, by Larry Crabb. This is one of those books that you can read, pick it up a couple years later and get something new from it. This is probably at least the third time it has taken space on my night stand and I am sure it will be back for several more visits before my days have ended, Lord willing. Next is a Bible I actually read now and then, who woulda’ thunk? Lastly is a novel by Susan Howatch, a favorite author of my wife’s. Ms. Howatch has yet to draw me into her vortex of fans. My first attempt at Howatch was a few years back, after reading four pages and having to go to the dictionary eight times in four pages, our dear Susan, kinda’ ticked me off – write a set or two lower please. So, I just put her back on the shelf and decided she did not intend for me to be included in her key demographic audience. I am going to give Howatch one more try – I don’t want to hold a grudge. Well that’s pretty much it. My night stand is now cleaned off and ready for some new additions. The cat is safe, don’t worry Choco. Thank you for your help, I will always take help with tidying up. As usual you are the best.